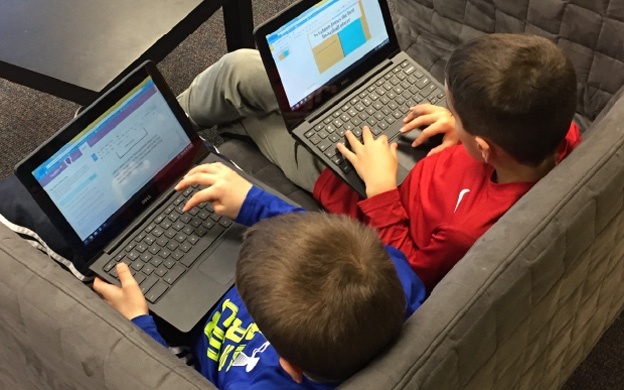 In the Spring of 2016, administrators at Saline Area Schools were looking for a way to bring writing and research projects to the front and center of the elementary curriculum. The Michigan district was already using eSpark in kindergarten through second grade to nurture strong reading foundational skills through engaging differentiated instruction and practice. Educators found that eSpark’s student-centered approach significantly accelerated academic growth, engaged students, and saved teachers hours of valuable lesson planning time. 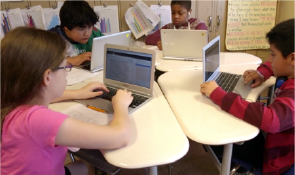 Wanting to build upon the success of eSpark, the district expanded their learning initiatives by bringing Frontier's differentiated inquiry-based ELA projects to over 300 third and fourth graders. Over the next six months, district leaders evaluated Frontier’s ability to nurture 21st century skills, working closely with teachers to monitor the platform’s impact on creativity, collaboration, critical thinking, and communication. At the start of each Frontier project, Saline students were presented with a variety of topics to choose from. Aligned to students’ unique skill levels, projects featured a wide range of engaging resources to explore including podcasts, videos, articles, infographics and activities. Carefully vetted by a team of former educators, Frontier’s curated research platform provided Saline students with the freedom to immerse themselves in a topic and develop strong research and digital citizenship skills within a structure needed to stay on task. Students honed their critical thinking and problem solving skills as they worked through these varied digital resources, becoming experts on topics of their choosing. Students honed their critical thinking and problem solving skills as they worked through these varied digital resources, becoming experts on topics of their choosing. An on screen note taking feature prompted students to engage in analysis, synthesis, and reflection. As Saline students worked through digital content in the order and at the pace of their choosing, they were often presented with contradictory or surprising points of view. This inquiry-based approach forced students to think critically about the information being presented to them and develop a nuanced take on a complex topic. Saline educators believe that students with strong communication skills are able to “use media and technologies and know how to judge their effectiveness and impact.” Upon working through one of Frontier’s resources and submitting their reading notes, Saline students were asked to evaluate the quality and usefulness of content they had just engaged with by selecting an emoji that best reflects how the resource made them feel. These emojis allowed Saline students to look back on the many resources they worked through and revisit content they found especially useful or surprising. Saline teachers report that this process allowed students to engage in metacognition as they learned how to evaluate and summarize digital research. “We've also gotten to delve into research skills... It's allowed us to discuss from which type of media we tend to grasp information the easiest,” says Ms. Amanda Webster, a fourth grade teacher whose students were using Frontier. "We've also gotten to delve into research skills... It's allowed us to discuss from which type of media we tend to grasp information the easiest,"
After they finished reading and evaluating Frontier’s curated research, Saline students were asked to inventively apply their learning to a real-world topic. Frontier taps into the creative potential of G Suite for Education, and Saline students used Google Slides and Google Docs to write nuanced responses to the guiding questions of their projects. At the start of the creation phase, Frontier asks students to review their reading notes, an exercise that reinforces strong writing skills while reminding students of the varied and surprising ways that information was presented in the resources they worked through. These reading notes remain on screen throughout the creation process, ensuring that students are appropriately citing their work and supporting their argument. Since launching Frontier, Saline students have created over 542 projects, building presentations, posters, essays, letters, screenplays, and speeches that successfully demonstrated their learning and communicated their unique ways of thinking. As part of the first national cohort to use Frontier, Saline students and teachers actively shaped the direction of the new platform. Once they completed their research and creatively applied their learning to build a project, essay, or presentation, students submitted a first draft of their work for peer feedback. A few weeks after implementation, Saline students found and reported that a number of their peers were submitting incomplete work. After hearing this from their students, Saline teachers advocated for an easy way to let students know that their project wasn’t quite ready for review. By carefully consulting students on what this solution would look like and how it would be used, eSpark Learning engineers designed a “Draft Incomplete” button to appear alongside work that was up for feedback. Actively shaped by the students and teachers that use Frontier, this new feature helps ensure that all student feedback is constructive and kind. Saline’s district leaders are committed to purposeful technology use and display a healthy skepticism when investing in new devices. After seeing how readily Frontier adapted to their district’s existing instructional models, administrators minimized spending by developing an ingenious mixed device system that utilized the best aspects of the district’s existing Chromebooks and iPads. As a web-based platform that integrates with G Suite for Education, Frontier allows students to access their projects from any device at any time. Saline students used classroom iPads to work through the research phase of their Frontier, listening to podcasts, watching videos, and evaluating articles. Upon completing their research, students switched to Chromebooks to better utilize Google Slides and Google Apps to build creative final projects in through which they developed stronged argumentative writing skills. Because Frontier is self-paced, while some students were working through initial research on iPads, others were already using Chromebooks to make final revisions on their project. By pooling district devices, multiple classrooms were able to use Frontier simultaneously and the district did not have to purchase any new hardware. After one year of inquiry-based learning through Frontier, student-centered projects have transformed instruction in third and fourth grade classrooms, engaging students and empowering teachers. Ms. Webster is a proponent of celebrating student growth and success, so much so that she’s printed posters of her student’s first Frontier projects to display in her classroom and highlight during conferences. Moments like these go a long way towards building students’ confidence and motivation to learn. Next Generation Strategist Heather Kellstrom reports that Frontier has successfully nurtured critical thinking, communication, creativity, and collaboration skills while preparing Saline students to take on new challenges. “PBL preparation is key for getting our students to the next level. Frontier is a way to practice all of those necessary skills,” Ms. Kellstrom says, referencing the project-based learning curriculum used in Saline’s 5th and 6th grade classrooms. Saline’s Favorite Projects: Should people keep wild animals as pets? If you could have one superpower what would you choose? Are video games bad for kids? 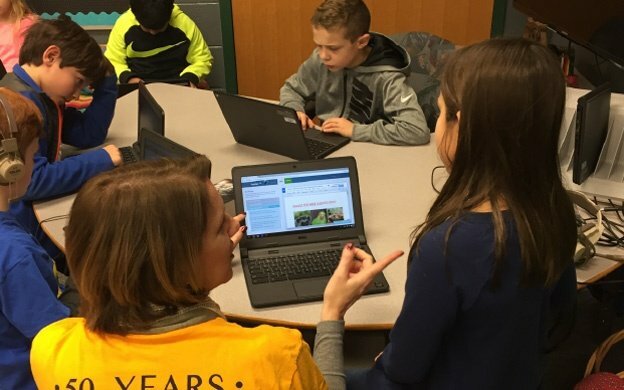 Within one academic year, over 300 Saline students have honed their writing and reading skills while becoming experts in timely topics such as CGI animation, self-driving cars, climate change, and computer science. Through Frontier’s engaging inquiry-based projects and their teachers’ dedicated support, Saline students are becoming lifelong learners as they develop the 21st century skills needed to thrive in tomorrow’s world. Students use iPads to do research and Chromebooks to draft and complete writing projects.